Dosnon & Lepage has no standard story of how in 18 whatever or 17 something someone's great-great-great-grandfather etc. Instead, they are a very new Champagne producer who in 2012 just released their 3rd vintage and who are using currently popular techniques, a mix of both modern and traditional, that are simply working to produce damn fine wine. They are located in the Aube, the far south of Champagne, less than an hour by car from Chablis. Created and run by Davy Dosnon and Simon-Charles Lepage, natives to the region, their wines are often described as "full bodied" and "mineral laden." In fact Davy Dosnon studied viticulture and enology in Beaune, Burgundy. Perhaps it's no surprise I find a white Burgundian character to their wines! Hey, they are closer to the City of Chablis in Burgundy than to Epernay, and their terroir is more similar to Chablis than that of Epernay. Dosnon did inherited vineyards from his grandfather in Avirey-Lingey, so there is a grandfather in the story, and Simon-Charles Lepage who had previously been studying criminal law in Paris, at least up until 2005, when he joined Dosnon. They produce their wines from 7 hectares of vines, two that they own in Avirey-Lingey and another five that they purchase fruit from. All the grapes are harvested by hand, no chemical fertilizers are ever used, the soil is tilled and ployed for aeration, and enough groundcover is left for the health of microbes in the soil. They embrace organic practices, use a very low dosage sometimes as low a 4grams/litre, minimal fining/filtration, and fermentation and aging takes place in 5+ year old 228 litre oak barrels from Puligny-Montrachet for most wines. Weaker or less structured wines are ages in steel. 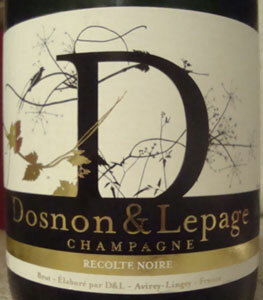 Recolte Noir - 100% Pinot Noir, hence a Blanc de noirs. As of this writing, this cuvee is based on the 2007 vintage with about 30% reserve wines. See the Tasting note below. Récolte Blanche - 100% Chardonnay. As of this writing, this cuvee is based on the 2006 vintage with about 30% reserve wines. Récolte Rosé - 100% Pinot Noir. As of this writing, this cuvee is based on the 2007 vintage with about 20% reserve wines. Made by the traditional method, where a small amount of still Pinot Noir (from Champagne) is added before the secondary fermentation. The nose starts with chalk, honeydew melon, minerals, and a hint of apple. A touch of honey emerges, but not honey as in a nicely aging wine, but raw, fresh honey straight from the bees. Immediately on the palate there is luscious juicy and very long lemon, with some lime and sweet orange. A touch of red berries is apparent as it warms and breathes and intensifies. Cherry and peach pit. After a couple of hours, creaminess and a white Burgundian character, not unlike a Selosse. Very powerful, well integrated, graceful, and elegant.